Welcome to the Steamboats.com Virtual Museum. This page lists upward of three thousand photos, including historic and contemporary boats, model boats, steamboat fine art, illustrations, and historic documents. These are private collections, so please request permission* for any commercial use of the images. A celebration of the Belle of Louisville's hundredth anniversary, in Louisville, Kentucky. Photos by Randy Davis. Steamboat chaser John Weise used GPS to follow the Belle of Cincinnati from Tell City to Chattanooga. Photos from a dinner cruise on the Belle of Cincinnati - also a hardhat tour of the Cincinnati Museum Center June 2018 during repairs and restoration. These photos were taken by Sandusky Williams on a trip down the Ohio River. Sent in by Ken Williams. See two prints of the City of Peoria. Sent in by Keith Johnson. Photos of cruise ships in Russia, sent in by Alexander Karpov, director of Russian steamboat crusises. See a collection of photos of this authentic paddlewheel steamboat based in La Crosse, Wisconsin, sent in by Pilot Eric D. Dykman. Jerry Canavit shares black and white photos of Streckfus boats from his collection (exhibit is 13 pages long). Steamships Delta Queen, Belle of Louisville, Megiddo Mission Ship, Majestic, Morningstar and Tarascon. A large postcard collection, posters, stamps, steamboat tickets, and a steamboat toy. (40 pages, start clicking). From the collection of Paul Urbahn. These photos show the Delta Queen, American Queen, Julia Belle Swain, Natchez and Belle of Louisville. All are currently in service (11 pages). From the collection of Allen Dale Strange. This is the largest exhibit in the Steamboats.com Online Museum. Through the generosity of collector Dave Thomson, we have 150 pages containing thousands of images of steamboats in the movies, waybills, magazine covers, ads, paintings, murals, photos, post cards, and assorted other ephemera. This is a private collection, so please request permission* for any commercial use of the images. A circa 1910 postcard of the Helen Blair, sent in by Steve Huffman. Links to a steamboat or maritime museum near you. More info. on a few of the boats listed on the 50 States page:California (Lake Arrowhead) -Florida -Idaho -Nebraska (Omaha) -Oregon (Salem) -Nevada (Laughlin) -Oregon (Newport) -Washington -West Virginia. Find steamboat photo collections at other sites, go to theLibrary & Maritime Museum Link Page(at this site). Permissions information: These images in these exhibits come from private collections, therefore we ask that you contact us* before using them for commercial purposes. For everything model boats at Steamboats.com, please go to our new model boat hobby page - click here. This National Historic Landmark won a special exemption from the U.S. Congress, which allows her to continue to transport overnight passengers. Learn the story of William Simpson, the man who built the Delta Queen and King, including photos. In December 1970, Rep. Edward A. Garmatz circulated an infamous letter to the U.S. House of Representatives, warning that if the Delta Queen burned, the "blood will be on the congress." The letter is from the archives of the Save the Delta Queen history. Interior and exterior shots of the paddlewheel steamboat, as well as photos of shore stops in Tuscaloosa, Demopolis, and Decatur, Alabama, and Columbus, Mississippi. 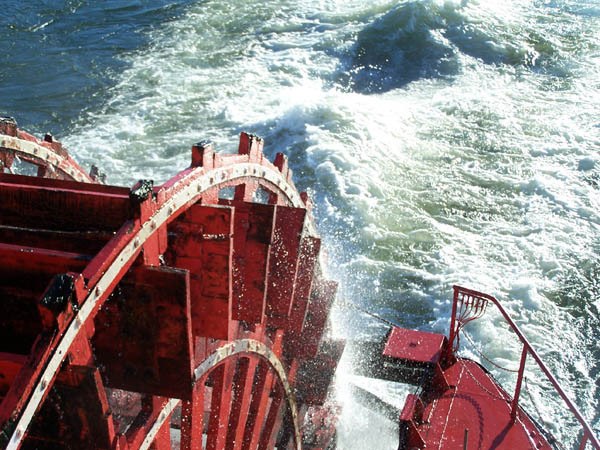 Also, video clips of the paddlewheel, engineroom, and river; October 2007. The Delta Queen stops in Louisville, Kentucky, on its final voyage after losing the exemption in 2008. The Delta Queen remained a hotel in Chattanooga, TN, for five years, before returning to the rivers. Photos by R. William Davis, October 24, 2008. The Delta Queen's twin was left behind in California when the Delta Queen moved to the Mississippi River. Now the Delta King has been restored as a hotel, theater, and restaurant in Old Town Sacramento. More history: 1957 photos of the Delta King from Kittimat, BC, Canada, where the boat served as a dormitory for men working at the Alcan Aluminum Plant. Photos generously provided by Thomas Mitchell. Three paper receipts from a trip on the Delta Queen, circa 1970. Find out more about the man who helped Betty Blake and the American People save the Delta Queen. The surviving younger sister of the Delta Queen: the boat's return to service after dramatic journey to join the mothball fleet in Beaumont, Texas in 2008; photos and commentary by Harry Smith, former fireman; maps showing her whereabouts. A series of photographs discovered in an attic portray the people who helped save the Delta Queen. Photos by Bill Muster. A photo at the bottom of this page shows Commodore Harold DeMarrero, Gordon Greene, Patrick Fahey, Senior Vice President Delta Queen Stamboat Company, Bill Muster, Shirley Bernstein, Ben Bernstein - President, BB Enterprises, Joyce A. Early - Senior Vice President - Finance of Delta Queen Steamboat Company, Ron Marcou - Senior Vice President - Passenger Services, Delta Queen Steamboat Company. Foreground - Frank Fried, President, Delta Queen Steamboat Company. Delta Queen Stories Memories fromMarguerite Verdino,Judy Patsch,Mel Hartsough,Jim Reising,Bob Reynolds,Kevin McCollister,Russ Ryle,Greg Menke,Ed Duemler,John Lewis,Randy Ward, andCharles Greene. Delta Queen blog and history Description: An online journal by Delta Queen historian Bill Wiemuth from aboard the Delta Queen chronicling life onboard, the Delta Queen's history, and her current struggle to survive. Information about the first two decades in California, when the Delta Queen and Delta King were known as the River Lines Fleet. The Delta Queen does her part for peace. The River - a memoir by Don Sanders about his life on the river. This story originally appeared as a weekly column in the Northern Kentucky Tribune. Archived at Steamboats.com with permission. by Marine Artist Jim Clary. Large murals of river scenes by Southern Illinois artist Kris Killman. Marcia Loudon's digital scrapbook kits allow you to use elements of the steamboat era to build pages for heritage family scrapbooks. This late Wilmington, Deleware artist did oil paintings of famous Deleware steamships. This late Cincinnati artist designed cards, logos, and other graphics for Greene Line Steamers and the Delta Queen Steamboat Company in the 1960s and 1970s. Search the link page devoted to steamboat art at this site. 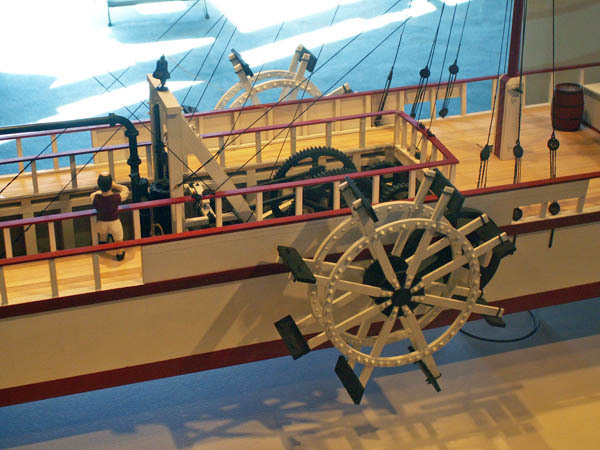 A sternwheeler built as a private yacht for the Brewster family of St. Louis. Information needed about this ornate antique. Help to answer a question about the location (Metaline Falls area of Box Canyon - border of WA and ID) and identity of the boat (Metaline) in this photo. Help identify a boat carved in a gold ring. Help identify a boat from old photos bought at an estate sale. Help identify a toy paddlewheel boat. Help identify a boat painted in a locket. Help identify a mystery boat from these model photos. Web master posted this postcard showing a mystery boat in 1998 and steamboat expert Nigel Clark identified the boat in 2005. Information Requested on this boat model. The signs on the side say "Three Rivers Transportation Company" . . .
As it turns out, 99.99% of the original paddle wheel steamboats now reside in heaven, and are no longer visible to us here on earth. This exhibit covers fatalities that happened on my watch. For more information about deceased boats, please visit our onboard bookstore - click here. Remembering the Mississippi Queen, younger sister of the Delta Queen: final photos before demolition, also photos of her in better days. The christening and information about the mystery of whether the CIA was involved in her construction. Although the Mississippi Queen is dead, the calliope muses live on in their new home on the northern bank of the Ohio River. Examples of the hundreds of blueprints uncovered in the Steamboats.com Museum mishegas. A report on the live and times of the The Lizzie Campbell researched and written by a descendant of the people who loved her. See photos of the venerable, late steamboat, including what finally happened to it (tragic story). One of America's great showboats, now lying in pieces in a yard in the St. Louis area. As performed in London, July 2015, program and photo of the stage. Bio of the author of A Century of Paddlewheelers in the Pacific Northwest, the Yukon and Alaska. Photos of the historic riverboat captain, his house, and the boat named after him. A collector found this rare Victorian fan autographed by steamboat employees in 1896. Hand painted to show the side-wheel packet Belfast, which ran on the lower Mississippi from 1854-1860. See examples of collectible steamboat jewelry, including pins, charms, and commemorative gold Mississippi Queen cuff links. See photos of the Nasookin Steamboat turned into a single family home with river views in Kootenays, B.C. The Belle busted a few bucket boards in a collision Oct. 17, 2009, ending the season early. Five photos showing damage to the wheel. A great photo of this little paddlewheeler that plys the waters of Bantam Lake, Morris, Connecticut. A small steamboat for sale, check out this fine instrument of a boat. Read the life story of this boat, by Margaret E. Gilbert, president and co-founder of the Missouri River Archaeological Exploration and Preservation Society. Photos of the Twain house in Hartford, Connecticut, by Nori Muster. See a beautiful 4' x 4' scarf based on a graphic the designer found at this site! Researcher David Dell is doing a documentary about the remains of the old boats in this country. The photos of an 1883 lithograph of the race between the Robert E. Lee and the Natchez were donted by Richard Sinex. Photos of these turn of the century boats donated by Jeffrey Davis (10 photos). This was the first exhibit on Steamboats.com in 1998, now it's back! Keith is now the curator of the Howard Steamboat Museum, so he has an even bigger wheelhouse of steamboat historic preservation now. Enjoy. An illustrated history of steam power, written by K. Spitzner, Georgia (1999). New & improved. Much safer than those old steam engines. Learn more about the history of steamboats down under. First it was a pilot house wheel, then it was a chandelier; now it's a steamboat wheel again. Pictures of steamboats and steamboat art from this region of Florida. The Dubuque, Iowa County Historical Society restored this old paddlwheeler. Now it's a "Boat and Breakfast." Currently on exhibit: First day covers from the Delta Queen Post Office. Answers to "Who built the first steamboat?" This is a more controversial subject than you might expect. Read all these experts' opinions and make up your own mind. 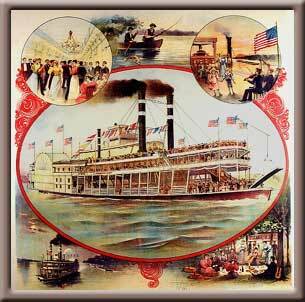 Find more steamboats and steamboat information online. See the launch of the cute lil steamboat built by Bruce Benton - just for fun! Steamboat lollipops: Best way to eat a steamboat. Also, steamboat clocks, jewelry, and more. Find steamboat paraphernalia through eBay! This exhibit offers examples of items that were for sale, spring 2004. If you have ancestry questions or other steamboat-related questions, or if you want to contact Steamboats.com to share your photos, stories, thoughts or memories please use our research room. If you are a steamboat expert, we invite you to visit the bulletin board to answer questions. Please post your answer to the guestbook so that it becomes a permanent record at this site for future researchers.